THC was founded in 1988 by David Howell and Robert Davidson (he is on the boring Meet the Team page too). It was originally set up in order to train practitioners to make homoeopathy work successfully in more cases than is possible with just Classical (Kentian) homoeopathy. We still teach the Classical method to a very high standard - it is the first method you will learn on the course. We also teach other methods of using homoeopathy which work better and more easily in cases that would be very difficult or even incurable with just Classical homoeopathy. You may have noticed that some people are trying to imply that Practical homeopathy does not include Classical ..... oh, the ways of the world when it comes to marketing. In the past we have taught in rooms in both Aston University and Birmingham University but recent years have been held in Dudley College behind the zoo - no more animal noises in the background. 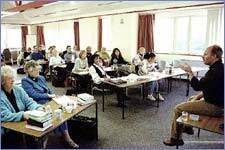 We moved to new premises in Quinton in 2006 and the teaching weekends are now held there. Details of our new addresses and maps etc are on the 'Contacting Us' page. Since 1988 we have trained and licensed over 350 Homoeopaths in the Midlands College alone, most of whom are now in practice. Close links exist between the three original colleges teaching practical homeopathy in Birmingham, London and Iceland, as well as with other homoeopathy colleges in the U.K. and abroad. We are members of The Homeopathy Course Providers Forum (HCPF), which is the voice of homeopathy training and education in the UK representing over twenty-five courses; the group meets four or five times a year to discuss opportunities and issues facing the profession. Find at more at www.hcpf.org.uk. All through these pages you will find invitations to come and meet us or ring us for a chat. You may like to come and spend some time with us on a teaching weekend, listening to lectures, meeting staff and students and generally getting a feel of the place. We don't bite, so please get in touch.